Impressively deep bass output from a powerful subwoofer with a beautiful exterior. Yamaha's Advanced YST II (Yamaha Active Servo Technology II) combines negative-impedance and constant-current principles to drive the speaker cone with extremely tighter control. 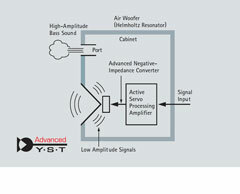 Using Advanced Negative Impedance Converter (ANIC) circuits, this system dynamically optimizes effective speaker impedance to maintain excellent linearity. 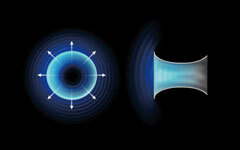 This means more stable and accurate low range response, not to mention higher sound pressure levels. This means more stable and accurate low range response, higher sound pressure levels, and the ability to reproduce clear bass without muddiness. The NS-SW901 derives its bass thrust from a built-in 600 W digital amplifier. Featuring Yamaha’s exclusive Power Engine chipset, it uses a constant gain PLL modulator circuit, a cross feedback loop circuit, an Active Power Control system, a highly efficient power supply and the highest quality parts. It delivers exceptionally high levels of power and sound quality, yet with low power consumption and compact size. The 25 cm (10”) cone diaphragm is made of Yamaha developed F.B.P., which is paper with a blend of carbon fibers and aramid fibers. Its extreme stiffness and extra-long stroke prevent distortion from occurring even during large, deep bursts of sound. The front firing design ensures extremely fast response and attack, and is especially suited to the accurate reproduction of music. The wooden ports are carved from a block of alder wood and aesthetically match the enclosure, the twin ports provide more port area without increasing the subwoofer’s size, as one large port would do. The shape is based on a natural logarithm to prevent extraneous wind noise. The NS-SW901 employs three-way mitered-joint construction at the cabinet corners and baffle/body connections to increase the tightness of the joints so the entire cabinet behaves as a single unit. This improves low frequency response and reduces unwanted vibration. A thick baffle (37mm; 1-1/2”) also minimizes vibration, adding to the overall benefits of the stiff cabinet construction. 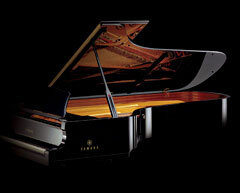 The glossy, lustrous finish is applied using the same techniques developed by Yamaha over many decades of manufacturing beautiful grand pianos. The BASS (Bass Action Selector System) function provides a selection of three modes to match the source being listened to. Wide for powerful sound with movies, Normal for natural sound with music and movies, and Narrow to cut unnecessary bass from music sources to enjoy clearer sound quality. 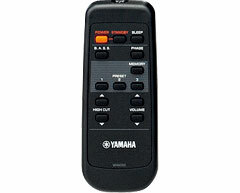 The remote unit makes it convenient to operate the subwoofer. It lets the user turn the power on and off, adjust the volume, adjust the high cut filter, select phase (normal/reverse), select BASS mode, engage the sleep timer and set and select the preset memories. Three combinations of settings (volume, BASS, high cut filter and phase) can be memorized and recalled at the touch of a button on the remote unit. Engaging the sleep timer shuts off the power after two hours. This is both handy and energy-saving, because people often forget to turn off their subwoofer.